Mish's Global Economic Trend Analysis: Another Definition of Deflation: Antal Fekete Defines Deflation as a "Pathological Slowing in the Velocity of Money"
Another Definition of Deflation: Antal Fekete Defines Deflation as a "Pathological Slowing in the Velocity of Money"
In an interview with the Daily Bell that just came my way, Antal Fekete writes about Blowing Up Modern Austrian Economics ... in a Good Way. To understand the interview discussion, one must first understand velocity. I discussed velocity at length in Will Prices Rise Significantly When Velocity of Money Picks Up? The simple definition V = GDP/M where V is velocity, M is money supply, and GDP is Gross Domestic Product. The first problem is how to measure money supply (Is Money M1, M2, or TMS? Each gives a different measure of velocity). The second problem with velocity is that GDP is a pretty nebulous concept given that government spending (no matter how useless) adds to GDP. Finally, I do not believe prices can be accurately measured. I post snips of the interview below, followed by my own comments. Sometimes I agree, and sometimes disagree with Fekete. Daily Bell: Please define deflation and disinflation from both a monetary and price standpoint. Antal Fekete: Deflation is clearly not the same as a falling price level. Technological improvements in production cause a gently falling price level under sound money that is no deflation. Defining deflation as a contraction of the stock of money is plainly wrong. We have a vastly expanding money supply, yet a lot of economists (including myself) hold that we are in the midst of deflation. 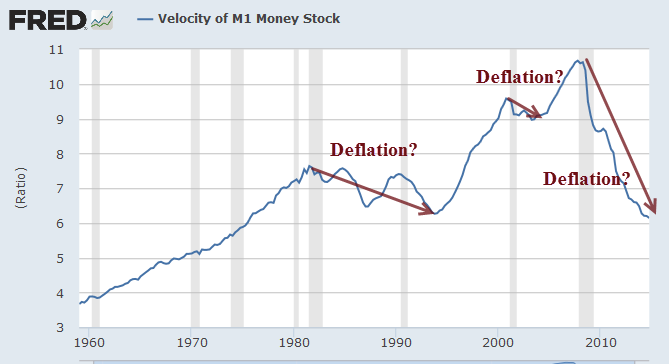 I prefer the definition of deflation as a pathological slowing in the velocity of money. Mish: I agree with Fekete that "price deflation" is a natural occurrence based on technology and productivity improvements. I also concur that deflationary forces are huge. 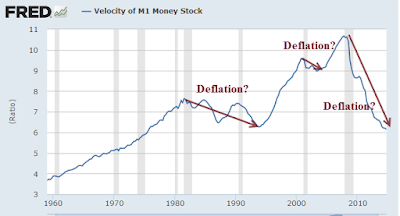 However, I disagree with his definition of deflation based on velocity. Given the clear and expanding bubbles in asset prices, I believe we are in a state of inflation. Nonetheless, I do expect another round of credit and asset deflation (my definition of deflation). Daily Bell: We think monetary deflation over a long period of time is difficult to accomplish in a central bank , money-printing economy. Comments? Antal Fekete: "Accomplish" is not the word. No one wants deflation any more than wanting a pathological condition in one's own body. "Occur" may be a better word. I disagree with your assumption that central banks' money printing is antithetical to deflation. I am in a minority of one in suggesting that just the opposite is the case: expansion of the money supply through open market purchases of government bonds by the central bank is the direct cause of deflation. I know this is counter-intuitive, yet true nevertheless. Mish: It's not counter-intuitive at all. The Fed prints more money than consumers and businesses want to borrow, so the money sits as excess reserves. Velocity drops. 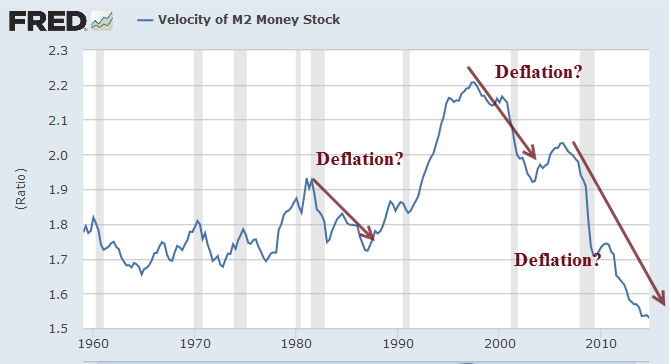 Fekete's definition states that falling velocity is deflation, so in that sense, the Fed does indeed "cause" deflation. It's simply a truism based on Fekete's definition. That said, he's not a minority of one. By sponsoring asset inflation, the Fed will indeed cause deflation. Our difference is he calls the present environment deflation, whereas I say a very destructive asset deflation will eventually result from current Fed policies. Daily Bell: Along with Rothbard , as we understand it, asset inflation itself leads to what seems to be deflation and disinflation. Money volume must go up to go down. Truth to this? Antal Fekete: I would modify language slightly: money velocity must go up first so that it could come down. Mish: Velocity does not need to do anything. It can go up or down or sideways. Asset inflation to the point of creating bubbles is another thing. The busting of bubbles would be a deflation event in my model and I would expect velocity to drop constituting deflation in Fekete's model as well. Daily Bell: If third-party credit facilities like American Express collapse, does this constitute monetary deflation? Antal Fekete: The collapse of any firm is a symptom of deflation, with a vengeance. It activates the 'domino effect'. Deflation breeds more deflation. The velocity of money spirals down. Mish: His symptom is part of my definition. My definition is part of his symptom. But we are not saying the same thing entirely. I would say it's clear we are in a state of inflation right now even though I believe deflationary forces will soon override that inflation.The reason I see inflation is simple: asset bubbles are expanding, and that is a clear symptom of inflation by any rational measure. Daily Bell: When central banks keep interest rates low, does this lead to disinflation and deflation? How so? Antal Fekete: The word "disinflation," which suggests that the Fed can turn the spigot on and off, is not in my dictionary. In fact, the Fed has no such power. It can certainly turn the spigot on, but we have never seen the Fed turning it off. Worse still, it has absolutely no control over how people will be using the extra money spewed from spigots or dropped from helicopters. Well, the smart ones would buy bonds, not commodities as the Fed hoped. They knew they could always dump them on the Fed in the open market with a hefty markup. Risk free. To answer your question, the central bank does not "keep" interest rates low. In fact, it "pushes" them low through open market purchases of government debt, which increases the bond price. The other side of the coin is the simultaneous decrease of the rate of interest. Of course, the purpose of the exercise, on a Quantity Theory argument, is the fomenting of inflation, not deflation. The trouble is that the central bank does not know what it is doing. It sows inflation but reaps deflation. Its monetary policy is counterproductive, to put it politely. Mish: I disagree with Fekete's notion the Fed wants to push commodity prices higher. I would say the Fed wants businesses to expand, wages to rise, credit to expand, and consumer prices to rise, most likely in that order. Higher commodity prices would be a very distant 5th, at best. However, I do like Fekete's explanation that the Fed does not keep rates low, it pushes them low with asset purchases. And I concur that the Fed has no idea what it is doing. Specifically, the Fed can print money but has no control over how it is spent (or if it is spent at all). Right now money sits as excess reserves and not spent. That is deflation in Fekete's book, but not mine. Fekete ignores asset prices (stocks, junk bonds, housing prices). While bubbles are inflating, we have inflation. In simple terms, expansion of asset bubbles is sufficient proof of inflation. The bursting of asset bubbles would typically lead to deflation, but I look at asset prices and the implied value of credit marked to market to make a determination. Daily Bell: If central banks are keeping interest rates artificially low, how does this contribute to monetary deflation? What do the bond traders do that makes monetary inflation into a deflationary phenomenon? Antal Fekete: It is not low interest rates that creates deflation but falling interest rates. The process is triggered by the central bank's open market purchases of bonds in an effort to pursue its inane policy of QE, eliciting the copycat action of bond speculators. A chain reaction is activated: bond purchases of the central bank alternating with bond purchases of the speculators. The central bank announces its time table for its bond buying program. Speculators preempt the central bank in buying first, dumping the bonds into the lap of the central bank while pocketing risk free profits afterwards. The expectation of the central bank, price inflation, does not materialize. It is frustrated by the bond speculators who hijack the freshly printed money on its way to the commodity market. Not to be deterred, the central bank prints more. To do that it has to go to the open market and buy more bonds, prompting speculators to preempt. The cycle now repeats and a vicious spiral is engaged. The upshot is a prolonged fall of interest rates that destroys capital across the board. Mish: I agree with Fekete's front-running of bonds thesis. To that I would add "realization" that capital was destroyed happens during the bust. It cannot be prevented. Daily Bell: Do you believe in the Misesian business cycle ? Does it have validity, in your view? Antal Fekete: Certainly, with some reservations. It does not assign a very high IQ to businessmen in the field. Why don't they learn from experience and factor into their calculations the distortion in the rate of interest due to monetary policy? I improve on the business cycle of Mises, pointing an accusing finger to bond speculation motivated by risk free profits. Businessmen are the brightest people we have. They are being victimized through the insane monetary policy of the Fed. Mish: Banks take risk-free profits for three reasons: They are capital impaired and cannot lend, creditworthy businesses do not want to expand, risk-free profits exceed expected profits from risk-taking. As far as victims go, everyone but those with first access to money are victimized by the monetary policies of the Fed. Daily Bell: Was the Great Depression a deflationary depression? We note that junior mining prices apparently went UP during the Great Depression. Antal Fekete: Most certainly it was. It is axiomatic that gold mining shares go up during a depression. Depression is just another name for capital destruction, and gold is the only form of capital that is immune to destruction. If you consolidate all balance sheets in a country (including that of the national treasury), then all liquid assets will be wiped out, with the sole exception of gold. Gold is the only asset that is not duplicated as a liability in the balance sheet of someone else. Mish: Actually, a stockpile of any valuable commodity owned free and clear is an asset with no liability elsewhere. I do not believe it is axiomatic that gold mining shares rise in deflation, but I would expect gold to do well. Daily Bell: Are we in a deflationary depression? Or are we in a kind of stagflation? Antal Fekete: We are in a deflation that is metastasizing into a depression. The monster word "stagflation" does not appear in my dictionary. Mish: Stagflation should have ended Keynesian theory right then and there. Keynes believed it was impossible to have a recession and inflation at the same time. The 1980s is a testament to the absurdity of Keynesian theory. Daily Bell: Has money volume increased in the US and Europe? Have prices increased in response? Antal Fekete: As I hinted a while ago, increasing the volume of money does not necessarily cause an increase in the price level. The Quantity Theory of Money is a false theory. In spite of an eightfold increase in the stock of money in America the price of crude oil was cut in half and the price of iron, copper and a number of other metals showed steep declines, thought impossible only a few months ago. If this is not deflation, then let me ask: How much farther do prices have to fall before we are allowed to use the D-word? Mish: The Quantity Theory of Money says "money supply has a direct, proportional relationship with the price level." Fekete points to falling prices and says "If this is not deflation, then let me ask: How much farther do prices have to fall before we are allowed to use the D-word?" By Fekete's own definition, falling prices do not constitute deflation. I believe he is speaking from the reference of what most economists believe (that falling prices constitutes deflation). Unfortunately, most believe that constitutes deflation. I call it brainwashing by the Fed and academia. Regardless, Fekete also misses the boat on the theory. Prices have gone up, just not commodities. The bubble is in assets (equities, housing, junk bonds), things that are impossible to measure precisely. I call that inflation. Fekete calls it deflation. But we both seem to agree that a big deflationary bust is coming. Daily Bell: Oil has apparently been manipulated down. Does this constitute price deflation nonetheless, or is it simply a kind of manipulation? Antal Fekete: The manipulation theory was invented by those who are afraid to face the facts squarely. We should know better: no valorization scheme ever works for any significant length of time for any commodity. It is another matter that foreign policy makers in Washington may have stolen a ride on the back of spontaneously collapsing crude oil to punish Putin. Mish: I am in perfect agreement on this point. Commodity price declines are about the slowing global economy, not oil price manipulation. There is more to the interview, and inquiring minds may wish to read further. Let's stop here and look at a few charts of velocity. As you can see, velocity depends on how one measures money, and even Austrians do not agree how to do that. My definition of inflation is expansion of money supply and credit with credit marked to market. My definition of deflation is contraction of money supply and credit, with credit marked to market. Both Fekete and I have definitions that differ from the pure Austrian concept of expansion of money. And we have been in the same boat in one sense. Neither of us thought the expansion of money would lead to huge "price inflation" and it didn't. The problem with defining inflation as an increase in consumer prices is that it ignores asset bubbles. Fekete's definition also ignores expanding asset bubbles. Judging inflation solely on the basis of money supply would cause one to believe we were nearly always in a state of inflation, even in states where banks, asset prices, and consumer prices simultaneously collapsed. Numerous Austrians who relied on money supply alone believed for years on end we were on the verge of high inflation or even hyperinflation. It did not happen. Fekete and I both got that correct. From a practical standpoint, I believe my definition explains the real world better than other definitions. In my model, and called for in advance, the US experienced deflation from late 2007 until March of 2009. At that point Bernanke managed to reignite demand for credit and the stock market took off. I expect another round of deflation when various asset bubbles pop. Meanwhile, and as long as asset bubbles are expanding, I do not believe deflation is the best word to describe current events. However, I would describe the current setup as highly deflationary looking ahead.